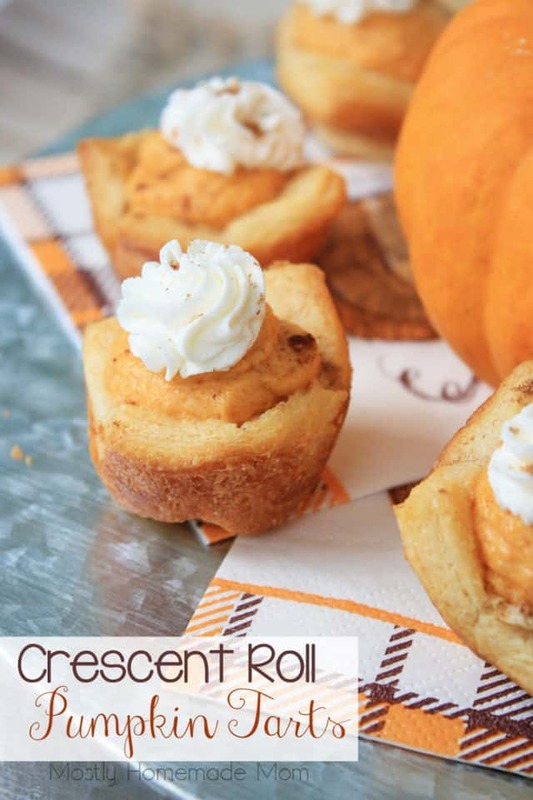 These Crescent Roll Pumpkin Tarts are wonderful for guests this fall! 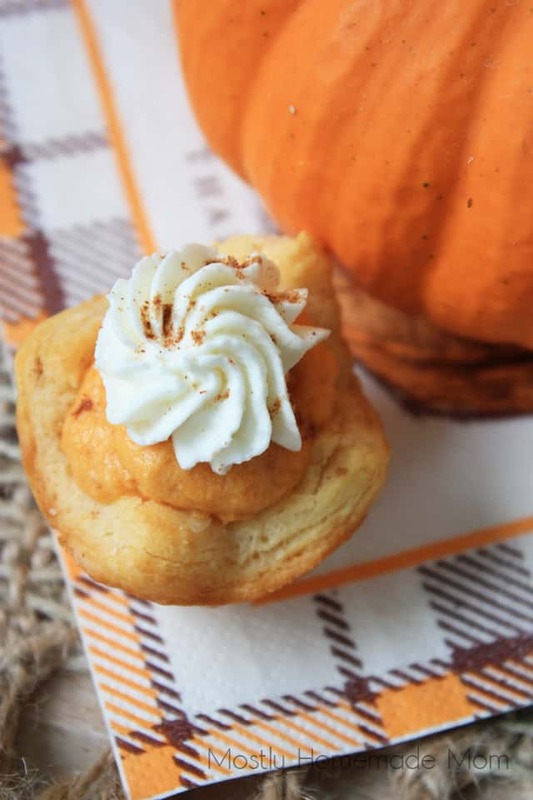 Fluffy pumpkin filling inside crescent roll mini shells and topped with sweet whipped cream! Living here among many, many Amish farms in Pennsylvania, there are roadside stands all over my area. It’s wonderful to be able to just pull the car over and grab some fresh grown produce and beautiful floral bouquets, often at a fraction of regular cost, whenever I get the whim. Right now, all the little roadside stands are filled with all sorts of pumpkins, gourds, Indian corn, and bright-colored mums. Every single year I buy 3 or 4 pots of mums in different colors. And every single year I kill them. Every. Year. It was one of the main reasons why I had labeled myself with a black thumb! Year after year I buy them, put them on my front stoop, and proceed to watch them go from bright and cheery to dry and crunchy in a matter of about 2 weeks. I’ve come to the realization this year though, that with so much success growing various vegetables in my garden, that mums are just not my thing! I’m still harvesting fresh salad greens, baby spinach, green beans, and tomatoes. Our small container of carrots should be ready for harvesting in a week or two. And I also have dwarf kale that is ready to be planted in the ground for some more late-fall greens that should tolerate frost pretty well. All of these plants, besides the tomatoes, I started from seed myself. But apparently, taking care of mums is beyond my realm of expertise! It looks like I’ll have to just enjoy these beautiful flowers from a distance in the fall. 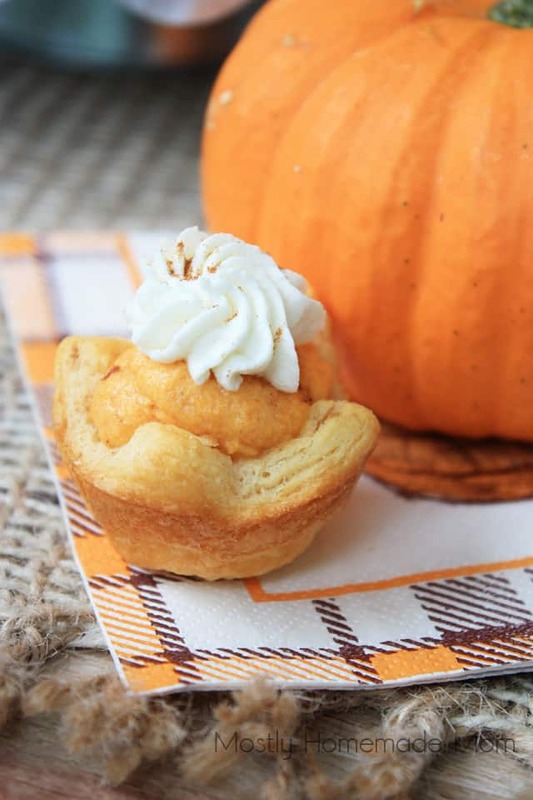 I’ll have to just make a 2nd batch of these Crescent Roll Pumpkin Tarts to make myself feel better. 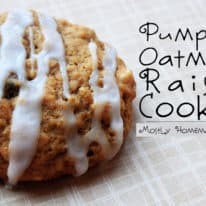 😉 I spotted this incredibly easy recipe in my one of my favorite fall cookbooks, Fun Fall Foods (*my affiliate link). I highly recommend this one! Separate crescent roll dough into two halves. Press perforations to seal. Cut each half into 3 rows length-wise, and 4 rows width-wise to create 12 squares of crescent dough out of each half. Place each square of dough into the bottom of miniature muffin cups. Repeat the same process for remaining can of crescent dough, fitting, the squares of dough into another miniature muffin pan. Bake crescent tart shells at 350 degrees for 9 – 11 minutes or until golden brown. Remove from oven and allow to cool slightly. Using the back of a spoon or a small cap (I used a clean extract bottle cup), press into the bottom of each tart shell. Remove carefully from pans and cool completely on a wire rack. Place whipping cream, sugar, and vanilla into a stand mixer bowl with the whisk attached. Beat on high for a few minutes until thick and fluffy. 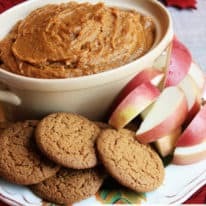 In a separate mixing bowl, stir together pumpkin, marshmallow fluff, pumpkin pie spice, and 2 cups of the whipped cream until smooth. Scoop pumpkin filling into a large ziploc bag, snip off the end, and pipe into each tart shell. Scoop whipped cream into another ziploc bag, snip off the end, and pipe on top of the pumpkin filling. 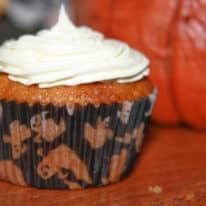 Dust tarts with extra pumpkin pie spice.